Tues. through Sat. at 8 p.m., matinees on Sat at 2 p.m. and Sun. at 3 p.m. According to Native American folklore, the appearance of the night heron foretells the coming of either good or bad luck. Certainly the protagonists of Jez Butterwortth's "The Night Heron" (at Atlantic Theater Company through Nov. 9) are badly in need of a dose of good luck. Griffin (Clark Gregg) and Wattmore (Chris Bauer) have both lost their jobs as gardeners at the local college after Wattmore socked a young scout in the troupe they led. Struggling to survive on poached rabbits and the dole, they're eventually obliged to take a female boarder into their shack in the Cambridgeshire Fens - the loud, intense and possibly psychotic Bolla Fogg (Mary McCann). Neil Pepe, the artistic director of Atlantic Theater Company since 1992, directs. Having previously collaborated with Butterworth when he directed the American premiere of Butterworth's "Mojo," at Atlantic, Pepe has an excellent feel for the playwright's dry British humor and bleak vision of salvation without real hope. Butterworth's writing is obscure and filled with Christian symbolism. His plotting is intricate, involved and circuitous. Often it's easier to understand what he wants the audience to feel than what he wants people to think. And in some ways the play seems to end exactly where it started. It's clear that the morose and suicidal Wattmore has been accused of a vicious crime, but it's not at all certain whether he's guilty or a Christ-like martyr. Is the garrulous Griffin merely trying to protect his friend? Does he have other motives? Or is he a Judas? Bolla freely admits that she has spent time in prison - some of that time in solitary. She also has a literary bent and has memorized volumes of poetry. For a while it seems that poetry may be the salvation for all three. In her gruff way, Bolla takes a liking to the two men - especially Wattmore, and as she states emphatically, when she really likes someone, she's willing to die for him. One has the same questions about Bola one has with the heron - is she the harbinger of good or evil, destruction or redemption? McCann's performance is nothing less than brilliant. She stomps on and off the stage like an angry lumberjack searching for his lost (probably stolen) dog. But it's hard to understand what is her motive or message. 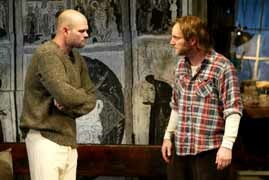 In addition to fine performances in the lead as well as the supporting roles (Jordan Lage is particularly funny and effective as the bumbling Royce), "The Night Heron" is also fortified by the combined efforts of sound designer Scott Myers, composer Stephen Warbeck and lighting designer Tyler Micoleau, who together create the isolated, forbidding atmosphere that surrounds the wooden shack. For those who like drama that's clear and not overly convoluted, slogging through the murky waters of Butterworth's fen will be a frustrating experience - more so because his material doesn't seem to really warrant such obscurity. Yet "The Night Heron" has image-laden language that touches on poetry and scenes that careen from the hilarious to the deeply moving. For those who don't mind an Agatha Christie mystery gone haywire and lacking a satisfying solution, "The Night Heron" is just the ticket.